Saturday, early evening. We’ve had a great day: Farmer’s market in the morning, followed by a hike in the rain at Mission Island Marsh, where we spot too many deer to count and throw driftwood into the stormy waters of Lake Superior. The kids don’t mind the weather: they splash through puddles in their rubber boots and twirl their umbrellas, tearing ahead of us on the trails and the boardwalk, sliding down boulders, making up imaginary worlds. We’ve spent the day with friends, a three- and five-year-old brother and sister and their parents, who are tag-teaming childcare for the weekend. Their dad accompanied us to the marsh, while their mom took over for an afternoon play date and dinner. Pancetta pasta with capers and cherry tomatoes from our garden for dinner — to be followed by apple-pear crumble made with fruit from I’ve picked myself. How locavore is that? Smell you, Nancy Drew. The kids eat quickly but heartily, making our hearts swell, pushing away from the table to go play in the basement until dessert, while the grown-ups linger over wine and conversation. Rachel and I are congratulating ourselves on the wholesome choices we’ve made: to embrace the rain and the grey rather than hole up inside with rangy children and DVDs. To feed them local food, healthy food, instead of macaroni and cheese. We are all three express our disdain for the school’s weekly hot dogs and pizza days — is it really appropriate? Have they switched over to whole-wheat buns, at least? We talk about how nice it is to be able to send the kids to the basement while we enjoy adult company. We take the crumble from the oven and serve it up on plates, so that it will be cooled for the children to enjoy. I walk toward the landing, just as my sons — my now Day-Glo sons — appear at the top of the stairs. 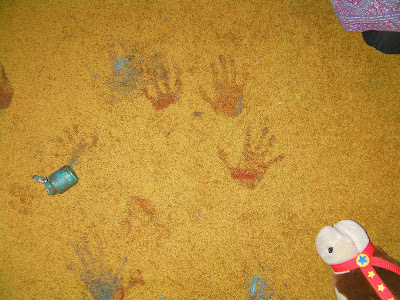 “We painted!” says Rowan, holding up his hands to show me. His hands are smeared with purple and black. His feet are bare, but it looks as though he’s wearing green socks. 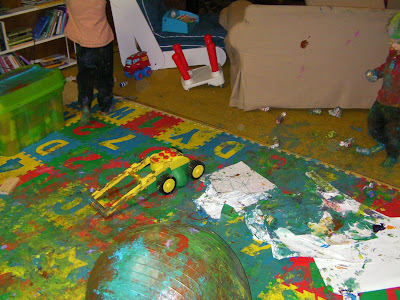 Isaac is right behind him, his hair a yellow and green mohawk with purple highlights, his hands and feet, his clothes, thickly layered with pigment. And then I did what any self-respecting mommy blogger would’ve done. I turned around and went to get the camera. We surveyed the carnage. Before I realized the extent of it, I took one picture. And then I put the camera away. 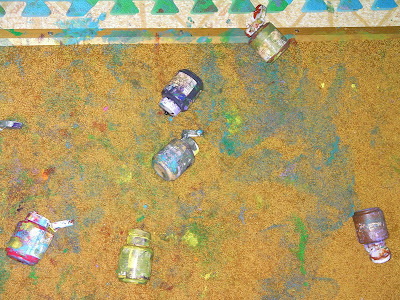 The four of them had discovered my acrylic paints, left over from a series of art projects, carefully packed away in a cupboard. They opened them, and then they proceeded to coat the entire basement — and themselves — with them. 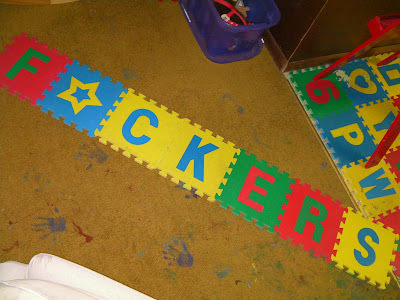 The alphabet tiles on the floor. The couch. 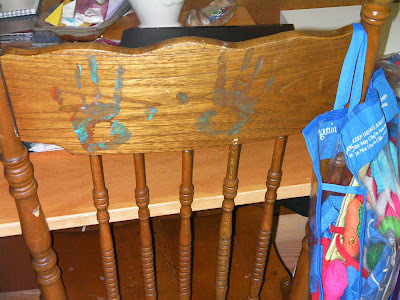 Handprints on the chairs and the carpet. The toy lawnmower, the yoga ball, the wooden blocks, the baseboards. The spare bed. Covered. In non-water-based, non-soluble, paint. What followed was a flurry of containment and clean-up: children stripped down and thrown into laundry sinks and bathtubs, clothing and sheets and furniture covers placed on rinse and then wash, shampoos and scrubbing, mops and rags and— “Don’t walk on the floor! Don’t go near the white couch! This is so inappropriate! SO INAPPROPRIATE! It doesn’t matter whose idea it was!” Clean clothes found and distributed. Apple-pear crumble dumped, unceremoniously, back into the pan, because none of the adults can fathom tucking into our nice little locally grown dessert after such a display of INAPPROPRIATE BEHAVIOUR. So, so, INAPPROPRIATE. You guys should know better. REALLY. And still, in the face of it all, in the midst of the chaos and carnage, and later that evening as Rachel and I mopped and scrubbed and threw in load after load of laundry, we couldn’t quite stop giggling, whenever we were out of earshot of the kids. “We’ll all laugh about this later,” I whispered to our friend as she scrubbed her kids down in our bathtub (“How on earth did you paint there?”). “We already are,” she whispered back. 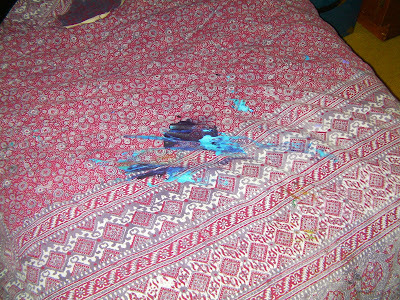 I wish I had a picture of four paint-soaked children to show you, but you’ll have to make do with the shots I took after the kids were in bed and Cleanup Part 2 began. Because the last thing I wanted to do was reward them for the destruction of the basement, and it just seemed to me that lining them up for a paint-smeared mug shots would send the wrong message: “Here’s one for the album! Aren’t you cute! Ah, kids and the hijinks they get up to!” So, at least this instance, parental prudence wins out over the best shot for the blog. Just barely. So, bed without dessert. The next day, Rowan helped me reassemble the floor tiles.